As the seasons change and we slowly begin to transition into colder temperatures, it’s time to start thinking about the changing landscape maintenance requirements of your residential or commercial property. When it comes to the health of your grass, one of the things you should be considering is whether or not you need to sod or seed it because there’s a huge difference between the two techniques and each one should only be used under specific circumstances. If you’re not sure which method of lawn care is right for your property, then continue reading for more information. What’s the Difference Between Sodding and Seeding? Sod and turf grass are both interchangeable terms in the professional gardening and landscaping industry. Essentially, sod is grass that’s been extracted from rich grasslands with the roots still attached to the surface of the soil for easy integration into any plot of land. It’s usually sold in rolled up bunches at most retail home renovation stores and is the preferable option for people who have large landscaping budgets or are planning on completely revamping their entire outdoor space from one end to the other. Sodding is also an ideal option for brand new landscape construction projects that are underway. 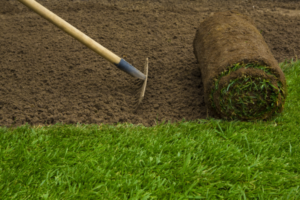 It’s highly advisable that you consult with a professional landscaper prior to commencing a large gardening and landscaping development so that they can advise you on the best time of year to install sod as well as the type of sod you need for your particular land. If you choose to hire a professional landscaper to complete the job for you, they’ll take all of the necessary preliminary steps to prepare your land and ensure proper sod installation. This includes aerating the existing land beforehand so the new grass roots can easily assimilate to it, clearing out any dead grass, smoothing out uneven plots of land, and making sure your sprinkler systems are in good working condition. Seeding is the choice lawn care method to use if your goal is to simply enhance the look of your existing grass, reinvigorate its essence, or patch up a small area where grass has died. All you have to do is purchase a bag of seeds from your local home hardware store or garden centre and sprinkle it across the affected parts of your lawn and water the grass regularly. Make sure that the type of seeds you buy matches the species of your existing grass, though. Keep in mind that the objective here isn’t to completely remove and replace your entire field of grass because this is a very time-consuming method of doing so. While it’s not entirely impossible to remove your old grass and generate new grass by using the seeding technique, most people simply don’t have the time or patience to take this route because it requires a great deal of discipline and additional attention to detail to make it work. And, good results aren’t always guaranteed. All it takes is for a little uneven sprinkling or inadequate watering and you could revert right back to square one. That’s why it’s always a good idea to hire professional landscapers like the experts at FOREVER GREEN LAWN & LANDSCAPE INC. to take care of all of your landscaping needs from the get-go. We serve Toronto and the GTA and we’ll take the time to thoroughly examine your property, remove all debris and dead greenery, and advise you on the type of plants that are perfectly suited for your specific environment. Contact us today to schedule a consultation with one of our landscape management professionals!